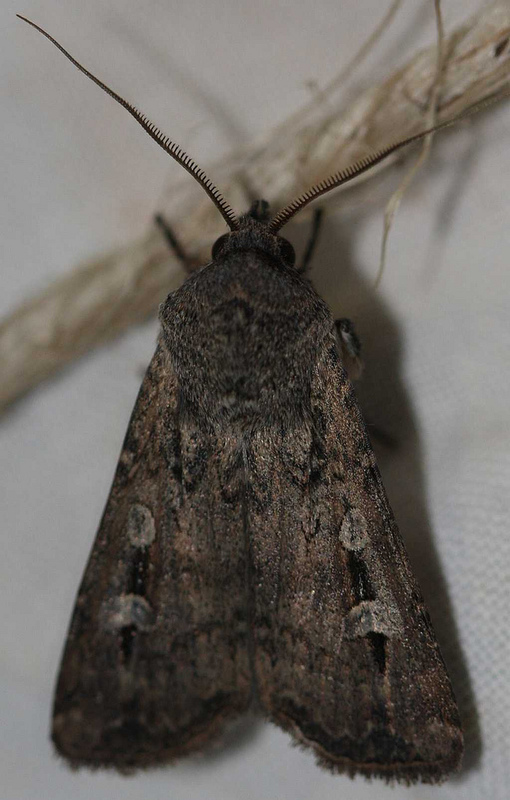 Swarms of Bogongs descend on our national capital every year—and yes, I’m referring to the brown and black moths, agrotis infusa, not to be confused with the Bogan, flannie mulleti, your typical spectator at Canberra’s Summernats festival of The Burning Rubber. Just before we began our road trip to Canberra this mid-winter, we heard the bodies of two snowboarders had been dug out from under four metres of snow after an avalanche ended their lives on Victoria’s Mt Bogong. It is to these alps, and the high country of the Snowy Mountains in NSW, that every spring the moths in their millions follow their songlines. They have been doing this for thousands of years. Bogongs bug the hell out of politicians every October (balcony doors cannot be opened, nor mouths so much). Despite Australia’s best efforts to consign them to the same fate as the swarming Passenger Pigeon of America, they just keep on keeping on and doing what Bogongs (and Bogans) do best: Eat, root and die. (One larrikin Bogong famously landed on Yvonne Kenny, mid-song, at the Sydney Olympics Closing Ceremony, and in 1865, Bogong moths invaded a church in Sydney, causing a service to be abandoned). Our destination is the elegant National Library of Australia on the shores of Lake Burley Griffin. If there’s a finer building in Canberra I haven’t seen it. Its classical marble columns announce the structure as a Temple of Learning, a repository of all wisdom, one might say. ‘It’s the place we keep our culture’, at least that’s what the schoolteacher was telling the little Aboriginal girls on a tour group I later encountered. ‘Now who can tell me what culture means . . .’ he asked. 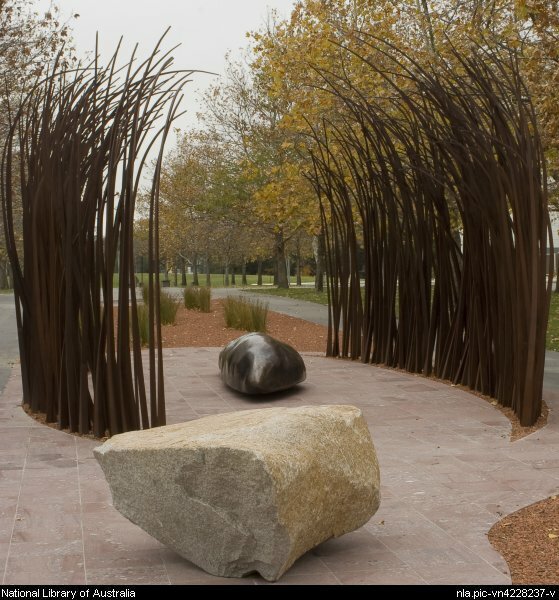 In nearby Reconciliation Place is Judy Watson’s Fire and Water sculpture, which ranks as one of my best experiences of public art. Up close is a rusty steel bower which appears to me to be cradling the body of a seal. I learn that the esteemed artist was in part representing the annual feasting that took place around the gathering stone when dilly bags swelled with fat, juicy Bogongs that sizzled on hot hearthstones. The deaths of those two snowboarders ‘living their dream’ on Victoria’s highest peak had again reminded me never to take a day for granted. But there was a simpler, sadder omen the day we went away. This is where they found the body of an Aboriginal woman, dead beside her flimsy tent after bitterly cold weather set in. She was 45 and had 10 children apparently. 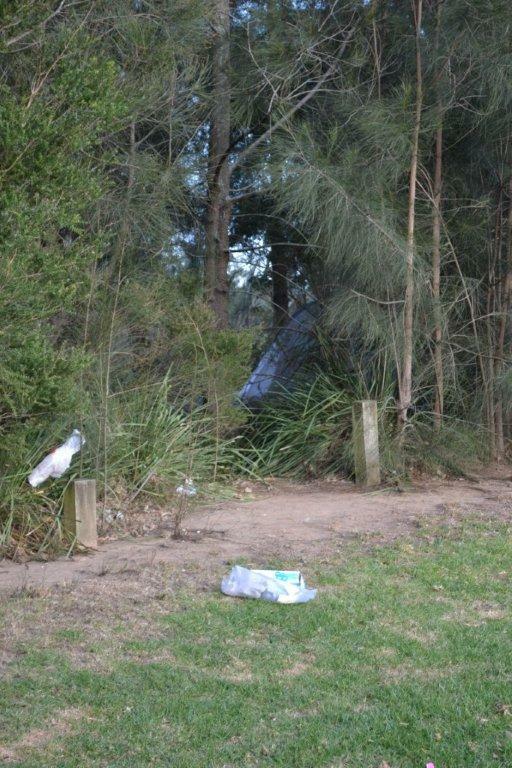 A closer look at the remarkable photo published in the South Coast Register shows how the dead woman lived in what the police called a humpy, just off the beaten track near Bomaderry Creek, a few metres from mown grass, warm houses and full bellies. She is one of our homeless, sleeping rough. Local shelters have since warned there will be more deaths as harsh budget cuts bite deep. I don’t know her name but she made me feel blessed for my life and opportunities, and that, but for the grace of God, there go I. She also made me feel ashamed that we turn our backs on our own people, and it is a disgrace. Poor Fellow My Country, indeed. The time has come the Walrus said . . . In Canberra, I had to submit to using a wheelchair for the first time. Even portable oxygen is not enough to keep pace with the able-bodied. One of my dearest, oldest friends in the world gave us the Platinum tour of the library including behind-the-scenes access, where automated drones fetch reader requests from the vast mileage of stacks. (And lest you think librarians shy and retiring, their staff noticeboard betrayed a big interest in Roller Derby meets). Life with lung disease has made outings rarer, but more memorable. My ‘new normal’ is one in which I cannot enjoy as much art and culture as I would like, but somehow, what I encounter is more sacred for its scarcity. Feast and famine, same as it always was. I cannot change the wind, but I can adjust my sail. And just like the First People, I feast when the moths are rising. This entry was posted in Uncategorized and tagged blog, Bogan, Bogong moths, Bomaderry, Canberra, COPD, Geoffrey Gurrumul Yunupingu, Gratitude, Judy Napangardi Watson, lung disease, Mt Bogong, National Library of Australia, Oxygen, Passenger Pigeons, Reconciliation Place, Rob Crawford, South Coast Register, Summernats, wheelchair, Wiyathul. Bookmark the permalink. I love the idea of our politicians disappearing under the black cloud of Bogong moths as it descends on Canberra, but fortuitously providing a tasty feast for the local indigenous people. That’s the only free meal they’ll get out of Canberra. It was tremendously sad to hear of the death of that homeless woman so close to my own home. Those of us living in comfortable suburbia can forget that it takes only a few, small steps onto the wrong side of the tracks to free fall right out of society and our heartless Federal government is gradually eliminating the safety net for these people. Good to hear your enjoyed your visit to the National Library, Bar, despite (or maybe because of) having to use a wheelchair: no aching feet after that brush with culture. Btw, I wonder how the young indigenous children would define “our culture” and what on earth they expected to see when they went inside? Thank you Bill, and hello. We are enjoying spring-like weather already. My partner is relieved I’m agreeing to use a wheelchair. I don’t want to be one of those chronically ill people who inflict their pride on others, usually our loved ones. But it’s still another marker on the journey, isn’t it? Dear Barb, Chris has given me your blog details. So pleased to be able to read your thoughts and news. You always were a wonderful writer and I see it continues.